Melyik progival sniffelted le a levegÅ‘t? MÃ¡snak a hÃ­vÃ¡saibÃ³l vagy Ã¼zeneteibÅ‘l a KC-t ki tudod nyerni a levegÅ‘bÅ‘l? Egy GSM gatewaybÅ‘l hogy lehet kinyerni? van rajta soros port, rj 11, meg rj45, egy doboz amiben van egy GSM telefon Ã©s Ã¶ssze lehet kÃ¶tni a vezetÃ©kes hÃ¡lÃ³zattal meg pc-vel is. Minden le van Ã­rva az rtl-sdr honlapjÃ¡n (is). I’m just trying method 4 (SIM card reader with SIMspy II) and I’m getting “The key is not available”. These are UK Vodafone MTM SIM cards, not sure if that is why. Odd – some have it, some don’t. Need to try and work out why. Interesting find, I too used a Vodafone UK SIM card. Did you try pulling the battery instead of powering the phone down? I just checked on my SIM card and it showed the same for me too – but I have used it on a network without any encryption (test network at Camp0). Right after I turned on my phone and let it do a transaction (it received a welcome SMS from Vodafone) it actually showed me the Kc. So maybe you can call your SIM card and then see if it has the key in it or not. 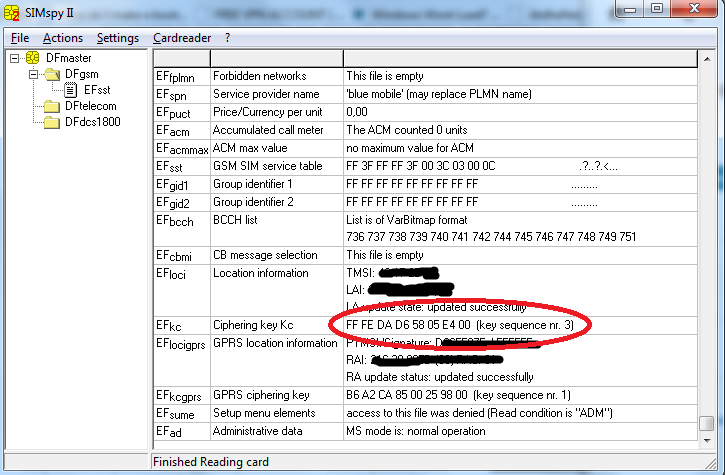 These are all M2M cards (I typoed MTM above) which can’t make voice calls – I think this might be why. In that case you can probably recover the Kc GPRS (if they could be used for data). There is a section called SIM Info. I see a lot of info there. Can the key be gathered from any of these lines? I was on this web site: http://www.cellmapper.net/arfcn. Afaik no, the property is called EF_Kc. I don’t see such propery on my iPhone. It would be nice if anyone can confirm that. I think to get the KC out of it you need to go into the baseband processor which is very hard… P.S. : is there any chat/irc to discuss? I think you are right with the TMSI, it could probably be extracted the way you described it. To get the Kc however you don’t necessary need to go into the baseband: simply pull out the SIM-card and read the value with a smartcard reader. If you don’t want to get a smartcard reader just use any old BlackBerry, they are really cheap (like 10-20 USD afaik) and their Engineering Screen shows all the stuff you would need. There is no IRC that I set up to address this topic, but all the projects I use have IRC channels (osmocom-bb does have one for sure). However I need to mention that for example the osmocom-bb channel isn’t really friendly if you are just interested about “cracking, eavesdropping, etc.” since they had a huge amount of script kiddies begging for some sniffing code and they got tired of them because the project’s main goal isn’t sniffing. I was looking to find the Kc on my blackberry, I got to the Engineering Mode screen. I can find TSMI and other details there, where do I find Kc ? Is it referred to by some other name in the BB Engineering Mode ? i am wondering how to give commands to my lenovo phone and where i type this commands ?